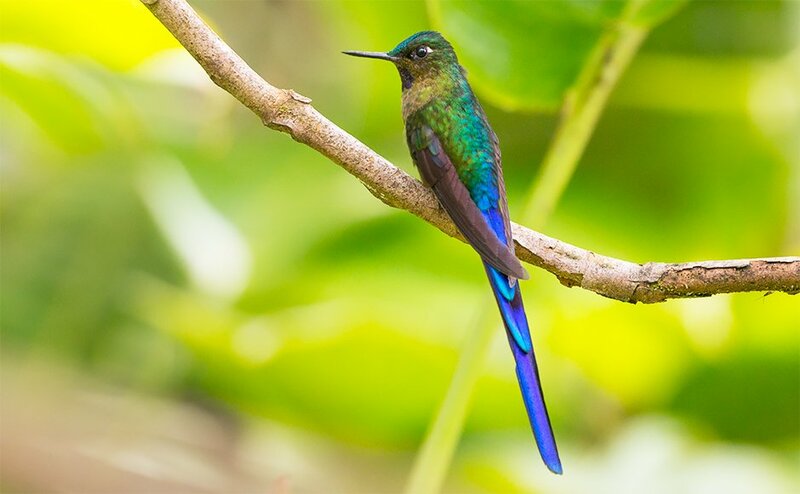 The Buff-winged Starfrontlet is one of about 345 hummingbird species on the planet. 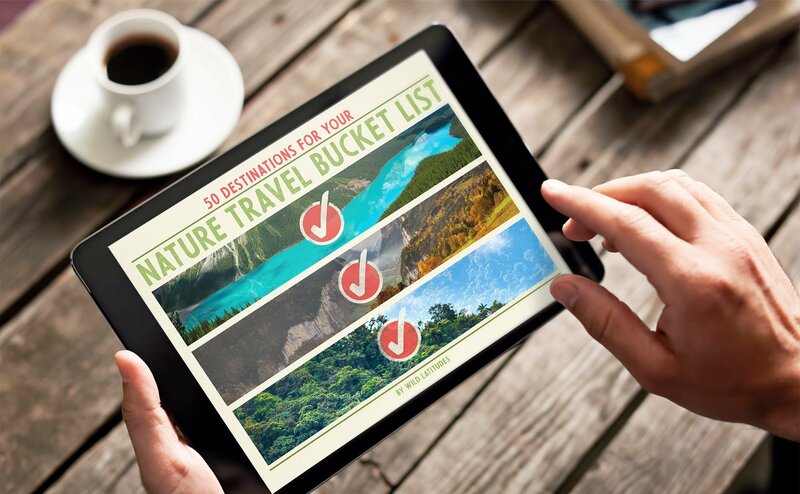 Each is a specialized product of a long evolutionary history. Flashy colors and aerial prowess have made hummingbirds the diminutive darlings of countless birders and nature lovers. Their evolutionary history is a fascinating story. Numerous superlatives can be applied to hummingbirds– among their ranks is the smallest bird in the world and the bird that migrates farther than any other (at least when body size is accounted for). The hummingbird family, Trochilidae, is super diverse and has the second highest number of species of any bird family. And of all animals, hummingbirds have the highest metabolisms. Seeing any hummingbird in the wild is a joy for most birders, but taken as a group, these tiny, hovering wonders offer an astounding array of color patterns, bill shapes, plumages, and behaviors. Why are there so many hummingbird species? What factors were important in their evolution? Biologists are starting get some interesting answers to such questions. The hummingbird family Trochilidae is nested within a larger group of birds: the order Caprimulgiformes. (Note: some authorities still place hummingbirds in the Order Apodiformes). This order includes hummers, swifts, and several families of nocturnal, cryptic birds such as potoos and nightjars. Most of these birds catch insects on the wing with short, wide beaks. Primitive hummingbirds split off from their cousins, the swifts, about 45 to 55 million years ago. In the long span of time since then hummers have diverged along their own evolutionary path, acquiring countless adaptations for life as nectar-drinking specialists. Modern nectarivorous hummingbirds with the ability to hover like this Collared Inca didn’t evolve until 10-20 million years after hummingbirds split off from their closest relatives, the swifts. We now know that those ancient hummingbirds first appeared in the in Europe and Asia. The tiny, hollow bones of hummers have rarely been preserved as fossils. Nevertheless, some remarkable fossils have been found— some of which even show feather details. The oldest hummingbird fossils were found in the Caucuses and in Western Europe. The earliest known hummingbirds, discovered as fossils in Germany, lived 47 million years ago and were more swift-like. Other fossils show that by 30 million years ago hummers had acquired bone structures for hovering flight and other traits unique to their kind. Perhaps the most intriguing thing here is that all living hummingbirds are found only in the Western Hemisphere. If hummers originated in the Old World, why aren’t they still there? All of the hummingbird species in the Eastern Hemisphere went extinct some time in the last 30 million years. 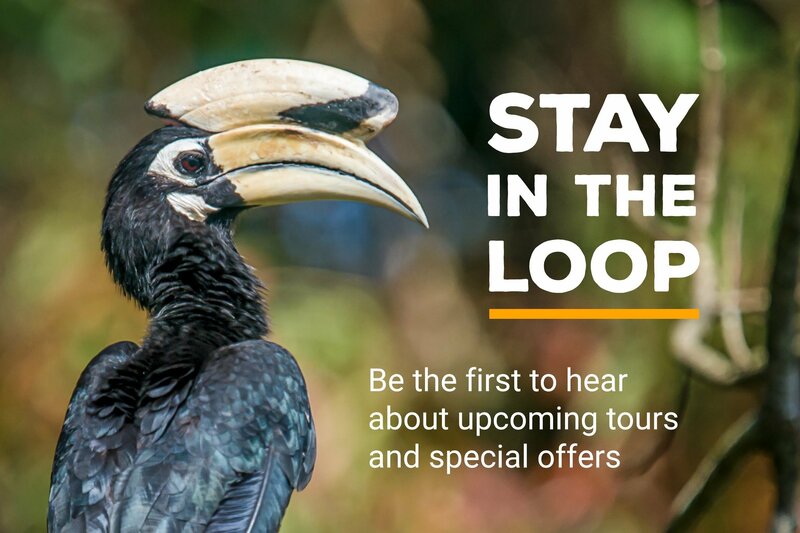 Explanations for their disappearance offered by biologists include competition with other birds and climatic changes. But no one really knows what happened. The extinction of hummingbirds on the continents where they first evolved is still a mystery. In the absence of hummingbirds in the Old World, a group that seems to be filling the “small, brightly-colored, nectar-swilling bird” niche is the Sunbirds (family Nectariniidae). At some point, millions of years ago, hummingbirds spread outward from their birthplace and made it to the Western Hemisphere. The most likely route of their migration was from Asia across the Bering Sea to North America. 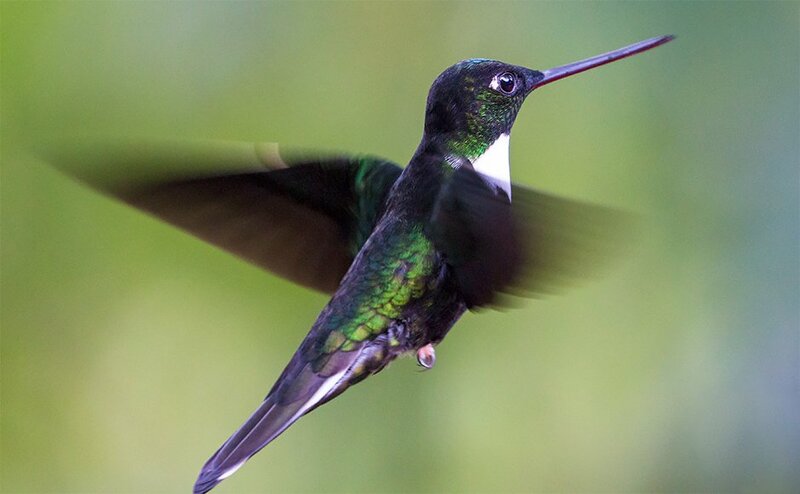 From the north, hummingbirds spread to South America. And that’s where things got crazy. Recent research using genetic data from hundreds of hummingbird species reveals that the diversification of modern hummingbirds began about 22 million years ago in South America. There was a veritable explosion of new species evolving in this newly colonized land. Biologists call the rapid appearance of many, closely-related species from a common ancestor an adaptive radiation. One of the better-known examples of this phenomenon is the radiation of Darwin’s Finches on the Galápagos Islands. Today there are more than 340 species in the hummingbird family. Only one other family of birds can claim more species (Tyrannidae, the tyrant flycatchers). The vast majority of extant hummingbirds are found in South America. Biologists are looking at connections between hummingbird ecology, genetic data, and the geography of the Americas to understand what forces gave rise to so many hummingbird species. One key factor in the history of hummingbirds is their close association with flowering plants. Flowers exist to attract pollinators. Long before there were hummingbirds, flowers evolved to attract insect pollinators. Flowering plants and insects both diversified across the planet over 200 million years ago. Each of these two groups stimulated the diversification of the other in a dynamic process called co-evolution. Co-evolution with plants has been strong in the history of hummingbirds. Sometime after about 45 million years ago, hummingbirds started switching from a mostly insect diet to a mostly flower nectar diet. Although modern hummers eat some insects to supplement their diet, they are marvelously well-adapted nectarivores. Flowers pollinated by hummingbirds tend to by tube-shaped and colored red, pink, or orange. Plants with flowers evolved to attract birds are called ornithophilous (“bird-loving”). Those long bills allow hummingbirds to reach into the flower tubes to get the sugary liquid hidden inside. By visiting numerous flowers of the same plant species, hummingbirds end up spreading pollen around and helping the plants reproduce. As hummingbirds evolved to become better at probing into flowers for nectar– and inadvertently becoming more efficient pollinators– their ornithophilous plant partners found ways of becoming more attractive and more readily pollinated. 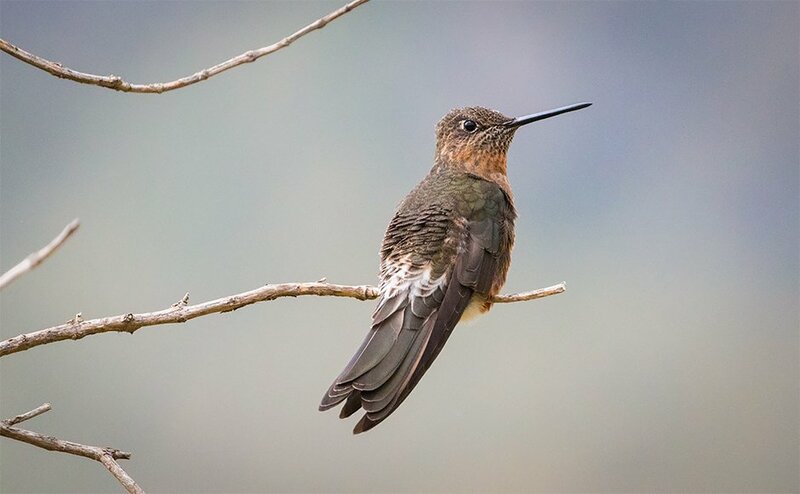 Although some species– like the Sword-billed Hummingbird– pollinate only one or a few plant species, many hummingbirds forage from a variety of plant species. It’s possible that the adaptive radiation of hummingbirds in South America is tied to the rich diversity of flowering plants on that continent, and the ability of dozens of hummingbird species to co-exist in a habitat by exploiting the flowers of multiple plants. The Sword-billed Hummingbird has a bill that is longer (3.5 to 4 in) than it’s entire body. Proportionally, this is the longest bill of any bird in the world. This species has co-evolved with the plant Passiflora mixta. 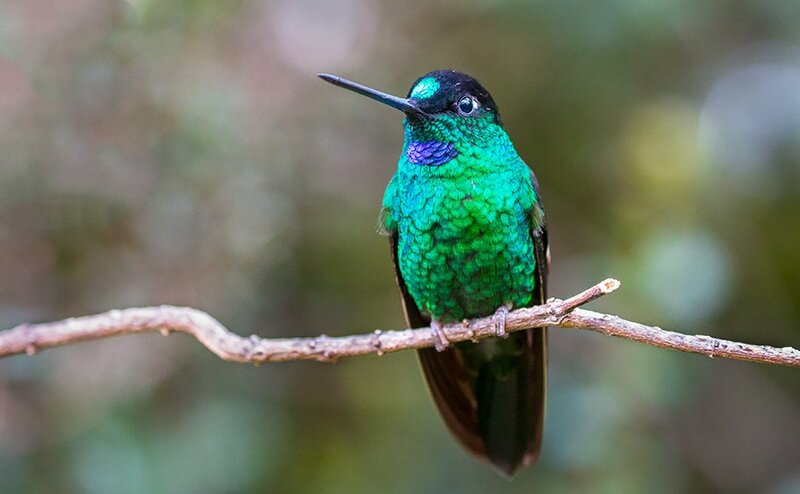 Over 140 hummingbird species are found in the Andes Mountains these days. This is a disproportionately high number, considering the relatively small land area covered by the Andes compared to the overall distribution of hummers in South America. For some reason those mountains have been a hotspot of speciation for hummingbirds (as well as other animals). The Andes have a long geologic history, but they pushed skywards rapidly between 10 and 6 million years ago. This corresponds to a time when many of the living hummingbird lineages seem to have arisen. Although high elevation habitats are harsh, numerous hummingbirds occupy them, including the Giant Hummingbird. Uplift of the Andes created a wealth of different habitats across all elevations: streams, canyons, cloud forests, high elevation grasslands, etc. The greater number of environments created by mountain building may have provided more niches for both hummingbirds and the plants they depend on. As with the famous example of the Peafowl (i.e. peacock), male birds often possess showy colors and/or plumage adornments. These features arise through evolutionary time because females are choosing their mates from among competing males. Depending on the species, females might be attracted to males with the boldest colors or the longest tail feathers. The end result of this sexual selection– a form of natural selection– is an elaboration of male sexual characteristics, among species and within species over time. Male hummingbirds exemplify this with their wide variety of sexual traits and behaviors. Some biologists argue that sexual selection has been not only important in hummingbird evolution, but is perhaps one of the main engines driving diversity in the family. Sexual selection has no doubt played a strong role in hummingbird evolution. The long tail of the male Violet-tailed Sylph is one example of what happens when female choice is a driving force in evolution. In the last 22 million years hummingbirds have been spinning off into new species at a dizzying pace. Biologists have used genetic data to discover that the species present today cluster into nine major branches of the hummingbird family tree. The deepest division among hummers lies between the branch that includes (a) topazes and hermits and (b) the branch including all other species. Topazes and hermits have been evolving separately from all other hummers for over 20 million years. The other seven groups/branches are: mangoes, brilliants, coquettes, the Giant Hummingbird, mountain gems, bees, and emeralds. 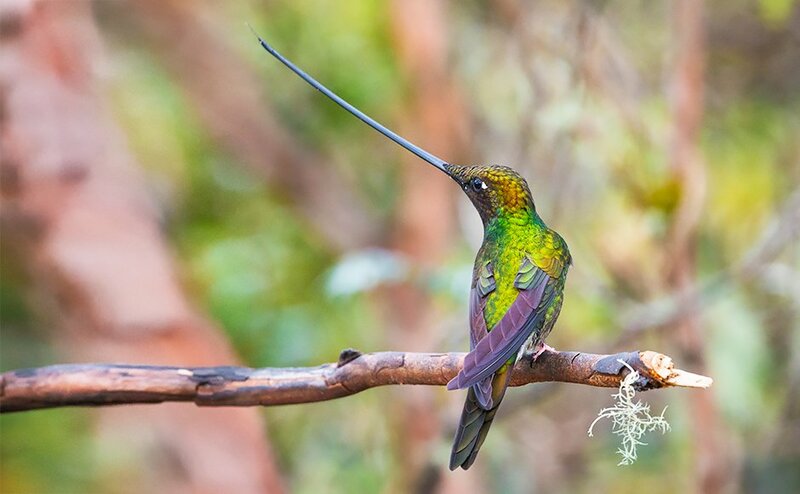 With a bill-to-tail length of 9 inches, the Giant Hummingbird is the largest of its kind. It is the sole representative of a lineage that split off from other hummingbirds about 15 million years ago. 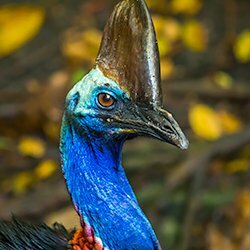 The impressive adaptive radiation of these birds seems to have been slowing down for millions of years. It could be that the available niches in South America are getting filled up. Despite this general slow down in speciation, a few of the hummingbird lineages have been cranking out new species much faster than the others. Bees appear to be the youngest branch and their speciation rate is much higher than the average rate across all branches. Bees include species familiar in North America, like Anna’s Hummingbird and the Ruby-throated Hummingbird. This group rapidly diversified as it spread into new niches on this continent over the last 5 million years. South America may be crowded, but North America and the Caribbean are still like an open frontier for hummingbirds. Evolution is an ongoing process, not just something that happened long ago. Hummingbirds will continue to co-evolve with plants and become ever more flamboyant through sexual selection. Although the speciation boom of 22 million years ago is long over, it’s nice to know some lineages are still forming new species. Maybe someday those new species will be adding some color to the pages of our field guides.